Much has been lost when it comes to the martial way in the name of physical skills development only. Yes, these skills are important but standing alone they are only a piece of the equation to the skills sets needed. The Protector Ethic: Morality, Virtue, and Ethics in the Martial Way is fantastically written and gets to the meat of understanding what it truly means to live the martial way and this includes an understanding and developing of those physical skills sets , but the all important mental and moral dimensions as well. "Placing ethics first, ahead of physical, tactical concerns, isn’t simply more difficult because it requires more training, more study, and skill. It’s more life threatening because it forces us to risk our lives for ourselves and others and thereby requires greater fortitude of will for the courage to act." 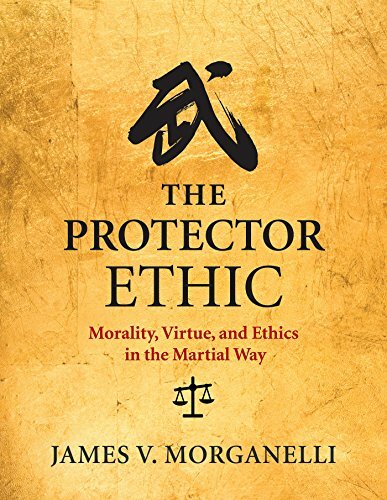 ― from "The Protector Ethic: Morality, Virtue, and Ethics in the Martial Way"
This quote, from the book, speaks to what I believe is the often forgotten or perhaps I should say overlooked attribute of moral courage, which is a key component to strength of character. Strength of character is the bedrock of which an ethos is built upon and connects the philosophical beliefs we must hold true with the physical and tactical skills necessary to influence the physical, mental and moral categories of conflict. Leaders in policing (my field) must ensure they not only develop an officers physical skills, they must as well develop the mental conditioning to decide under pressure and the moral dimension that our ethos is built upon. Although this book is not written with police specifically in mind, policing can learn much from what the author has written. The police are protectors and guardians. The warrior mind set is much more than tactics and physical skills. Policing must tie their actions with their ethos and the oaths they swear to uphold. "On my honor, I will never betray my badge, my integrity, my character or the public trust. I will always have the courage to hold myself and others accountable for our actions. I will always uphold the constitution, my community, and the agency I serve." What connects the warrior and guardian (I believe they are one in the same) is a common ethos. Ethos, is a Greek word meaning "character" that is used to describe the guiding beliefs or ideals that characterize a community, nation, ideology or a police force. We must address the realities of policing that include conflict and violence, and the use of persuasion and force and the physical, mental and moral conditioning necessary to not only prevail in a fight but to win in the yes of the people we serve. In policing a free society the strategies and tactics we use must be seen as legitimate. Also police must not be hesitant due to confusion over games with words warrior or guardian, escalation or de-escalation, persuasion or force, soft or hard skills etc. all are two sides of the same coin and require a deeper understanding on behalf of policing and the public. This is a complex and emotional topic and the books goal is to attempt to bridge or connect the warrior verses guardian gap that has created so much turmoil throughout society. The premise is that policing and those we police must understand peacekeeping requires both the warrior spirit that is rooted in the protector and guardian ethos that makes up the American way of life. Building on the symbols and traditions of our oath, policing indoctrinates its ethos into recruits during basic training. A "police academy" certainly challenges men and women fresh from high school or college, and brings them, firmly and quickly, into the police culture. But does this indoctrination into police culture actually build both the ethical framework , those value and traits (strength of character, courage (moral and physical), respect, honor, integrity, trust, justice, dependability, discipline, selfless service, etc.) to tie in with the physical and tactical skills necessary to carry out police duties effectively while at the same time building trust throughout our communities? This is something we must reflect upon. This great book teaches you those attributes that encompass the warrior mindset which includes our ethos, the ethical code or the moral components to policing that have always instilled a guardian or protector mindset. He also teaches you how to apply these to our daily lives, professionally and personally.